Milliner on the Move headed interstate in 2011 with the Hats by Felicity collection unveiled at events in Western Australia, Queensland, NSW and Victoria. 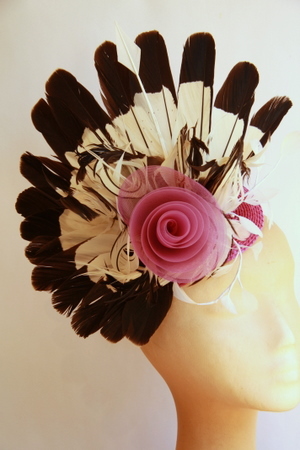 135 Hats by Felicity creations were individually designed, crafted and adorned by race goers across the country, as well as brides and wedding and other event guests. Fashions on the field and best hat winners collected the prize in Margaret River and in Broome this year and already, the orders are flowing in for 2012. Plans are now hatching for this Milliner to get on the move again and the 2012 Hats by Felicity collection has the first headpiece complete; so hold on to your hats ladies and gents because the dust will only have a moment to settle till this Milliner is on the move again.